A new report claims that if plastic consumption goes on at the current rate, the weight of plastic clogging the world’s oceans will exceed the weight of all fish by 2050. The report, The New Plastics Economy: Rethinking the Future of Plastics, was unveiled on the opening day of the annual summit of the World Economic Forum (WEF) in Davos, Switzerland. The report is the first of its kind that assesses global plastic flows and makes a case for reinvention of the plastic economy owing to the tremendous waste involved in the current model of production and consumption. The implications of plastic production and consumption are further magnified by low levels of recycling in plastics (15 per cent) after which only 5 per cent is retained for subsequent use compared to recycling rates of paper (58 per cent ) and iron and steel (70-90 per cent). The authors of the report estimate that approximately 8 million tonnes of plastics leak into the ocean every year which is roughly equivalent to “dumping the contents of one garbage truck into the ocean every minute.” This amount is slated to double by 2030. The report was prepared based on interviews with over 180 experts and through analyses of more than 200 reports. Researchers argue that the current linear model of production and consumption must be brought closer to a circular model in which a collaborative effort between the public and private sectors must ensure that plastics created are both recycled and composted. The detrimental effects of plastics are known all over the world. Yet only a few governments have banned plastics in their states or countries. The usage of biodegradable tetra packs by many companies is a welcome step and others should follow this example. 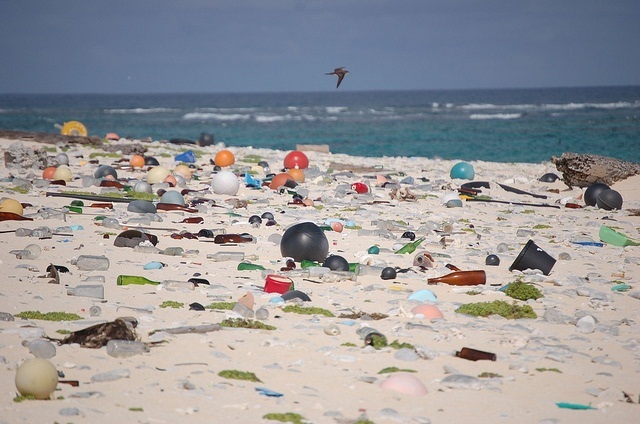 The parliaments of concerned countries must pass bills banning use of plastics of all grades. We had a happy survival on this earth even when plastics were not discovered. Hence we can do without it even now.